 Specialised in international tax and legal strategies, Taj, a Deloitte network entity, is one of the leading French law firms. Our firm currently employs more than 545 professionals including 63 partners. Taj has offices in Paris-La Défense, Bordeaux, Lille, Lyon and Marseille. Thanks to its local coverage, Taj provides clients, throughout France, with its legal and tax expertise, meeting its clients’ geographical and sectorial needs. Thanks to Deloitte’s leading global network and to the expertise of more than 44.000 Deloitte tax specialists worldwide, Taj operates internationally.  Our experts propose new solutions that combine the mastery of complex legal and tax issues with a business culture enabling a tailored response to the strategic challenges of companies. Agility of mind and character, facilitating adaptation to an environment with a resolutely international outlook. Our partners and associates support business leaders, whether they are listed on the Fortune 500, on the CAC 40, or are family-owned companies, in the design and global implementation of their tax and legal strategies. The solutions that we build with our clients are based on innovation and are always tailored to specific situations. This means looking beyond the legal framework to embrace our clients’ entire world, incorporate their issues and contribute to their growth strategies. We build long-term relationships with our clients. Whatever their size or business sector, our clients are guaranteed ongoing and personalised support at all stages of their development and growth. In order to respond to the complexity and diversity of the legal and tax issues our clients are faced with, our firm mobilises high-level specialised teams working according to the same strict quality requirements under the responsability of a partner who manages and coordinates our multi-disciplinary service offering. He is the special adviser of managing directors, chief financial officers, tax directors and chief legal counsels.